BOX has been designed for continuous operation; 24 hours a day, 365 days a year. One aspect of this design is a comprehensive monitoring and alerting facility, which provides monitoring and supervision of all aspects of the system. The monitoring module continuously receives live updates with statistical information from each individual component. Any exceptional event or problem, such as a failure of a communication link is forwarded to the monitor and an appropriate recovery action is automatically undertaken. For centralized system control and supervision, BOX can interact with external facilities and systems such as Syslog, an operator console, file based data exchange, event driven monitors or via SNMP with registered MIB. 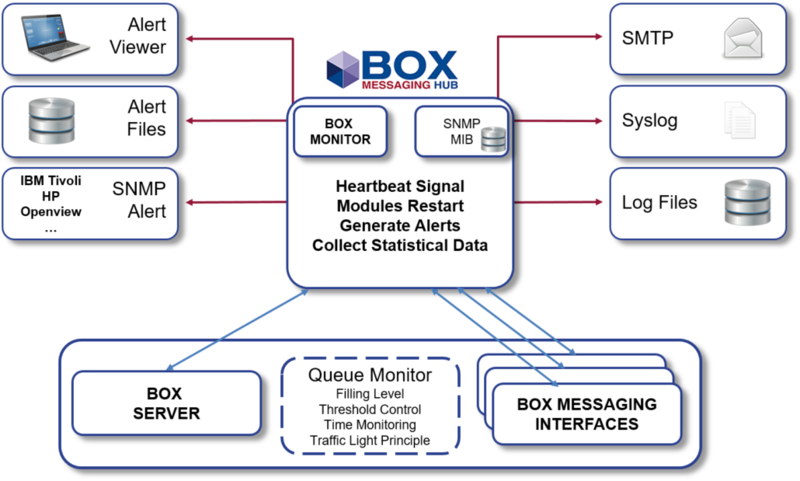 BOX provides a queue monitor that enables easy and comprehensive supervision of queues. The Audit Log contains a complete history of all configuration changes and the „Message Audit Log” provides comprehensive information about all user interaction with messages and is query able using various filter criteria.